When Tim Burton's Batman first came out on VHS (yes that's right kiddies - VHS), I developed the mutant ability to fast-forward from one Jack Nicholson/Joker scene to the next, without missing a beat. Today Entertainment Weekly released this full pic of Hugo Weaving as The Red Skull in Captain America: The First Avenger, and suddenly I'm thinking that history at the very least could be about to repeat itself. Done staring at all that evil goodness? Then jump over to the pages of Entertainment Weekly for a pretty full on interview about why the Nazi villain's main opposition is better than the Man of Steel. Now I on the other hand appreciate the casting for Mrs. Kent. I love me some Dianne Lane. Love the Red Skull pic too. As usual, great minds think alike. I'm more nervous about Superman than any comic movie I've ever heard of. Not because of the production team, but just because it's Superman. He's the #1 dude in the game and I think if it flops the comic book movie boom will crawl to a whisper, but if he soars it could really be the spin for positive heroes Hollywood needs. Now when they cast Brainiac - then you will see one excited Dan! oh man that Red Skull looks wicked! that make up job would be good also for Skeletor if they ever made a Masters of the Universe movie. I don't know about that Dan. As long as the Marvel films keep producing decent ones I think the comic movie boom will be okay. Even if Superman flops, although I will be very sad if it did. And I'm with Craig about Diane Lane. No reason why Superman can't have a good lookin' Mama. Jonathan Kent had to have a reason for marrying her in the first place. 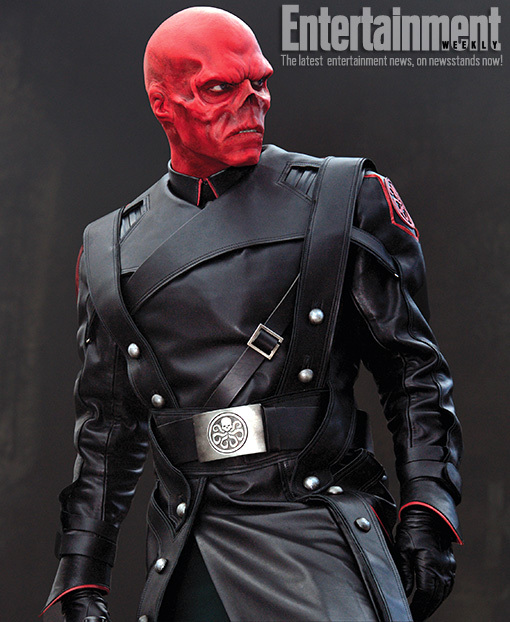 The Red Skull looks AWESOME. I'm so excited about this. Not as excited as Thor, yet, but then..heh...no Hammer. Dave if Skeletor had looked this good, that MotU movie would have been....aw who am I kidding, that movie still would have sucked out loud. Thanks Random. I was going to avoid the Supes movie after taking my oldest two to see the last one in the theater, but I'll see it if just for her. I saw Judge Dredd just for her. That and the scene where he shouts.."I am the law!" Still makes me giggle. Although it's better with a few shots. And yeaaaah...the old MotU movie...where the ultimate weapon is a...synthesizer. Gotta love that. They need to make a new one just to erase that stain. yeah, I was hoping Orko showed up in that movie about half way through. My best friend dragged me to see JD in the theater. I think that's just before I started reading comics. We didn't do any shots before the movie, but when we got back to the dorm I think we polished off the ol' Tropicana Twister and vodka in our giant Mickey D's Batman Returns cups. Masters of the Universe! Now that would be cool - I still think there's room in Eternia for another BOOM yet! The best thing about the last movie was the woman who played EvilLyn - holy moley she was wicked. The movie was too tech for me - I always pictured MOTU more sword and sorcery than that made it out to be. Otherwise I kept waiting for Stratos to fly in and save the day - And Battle Cat vs Panther. That would've rocked. Thanks folks these comments are really awesome!! Snarf, Orko, Jar Jar Binks and other alike characters just need to die once and for all. it's that simple. i just don't know why producers keep putting crap like that in movies that they all should know by now are hated by the primary fan base.